Sounds like it could start off as a really funny joke, doesn’t it? Well, it’s not a funny joke – it’s my life. 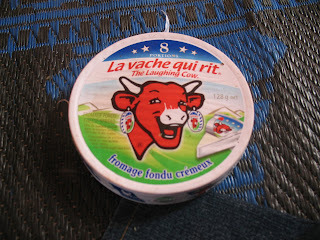 Around the world there is something called “The Laughing Cow” cheese – here it’s called La Vache Qui Rit (obviously, translated into French). Well, how many of you know my addiction to cheese? Yes, raise your hand now. I mean, if you’re not privy to such info, think of me every time you look at a block of Colby-Jack or Pepperjack. Never pass by the bag of already shredded Mexican 4-Cheese Blend without wanting to put it on a tortilla, microwave it for 20 seconds and then dip it in salsa. But, I digress. So, La Vache Qui Rit. Did he really laugh? I laughed the first time I saw this cheese and I thought, “Wow, how gross is this?” Cheese that can sit on a shelf for 2 years without going bad – are Twinkies in the recipe? I even tried it once…plain. Just popped it right in my mouth and chewed. Possibly the worst mistake for a cheese addict. If you’re looking for a way to get over cheese, pop a triangle of Vache and you’ll never want dairy again. Needless to say, I swore it off, promising myself that every trip to Bamako would be full of dairy and I could survive like that. Then September 9, 2007 rolled around – a day that will live in infamy. Someone left some Vache at the bureau in the refrigerator and I had some extra bread. So, I decided, you know what, I’ll try it again. Well, 28 hours and 20 triangles of Vache later (yeah, I slept for about 8 hours), I’ve converted to the love that is highly processed cheese. Well, this new love couldn’t possibly come at a worse time. Starting on Thursday is the Muslim holy month of Ramadan. A month where fasting is the norm and strictly followed. I thought this meant just no food, but it literally means not swallowing anything (even saliva) between sunrise and sunset. So, what does this have to do with Vache? Well, this year I’ve decided to fast. Of course, like most things, I’m making a modified version of my fast and my teammate Beth accurately coined the term “The Toubab Fast.” Basically, I’m still going to continue to hydrate myself all day because if I don’t, I will most likely die from dehydration (I’m not joking) and no one wants that to happen. It’s in all of our best interests, really. Clearly there will be more to come regarding my month long fast. So, for now, Vache will stop laughing. Maybe he will cry for me because I can’t enjoy him during the sunlight or maybe he will dance around in joy that I can’t consume every package of processed cheese in the cities of Sevare and Mopti. Who knows. But we can all rest assured that Vache and I will be having daily meetings, most likely at the break fast meal at sunset. How romantic!